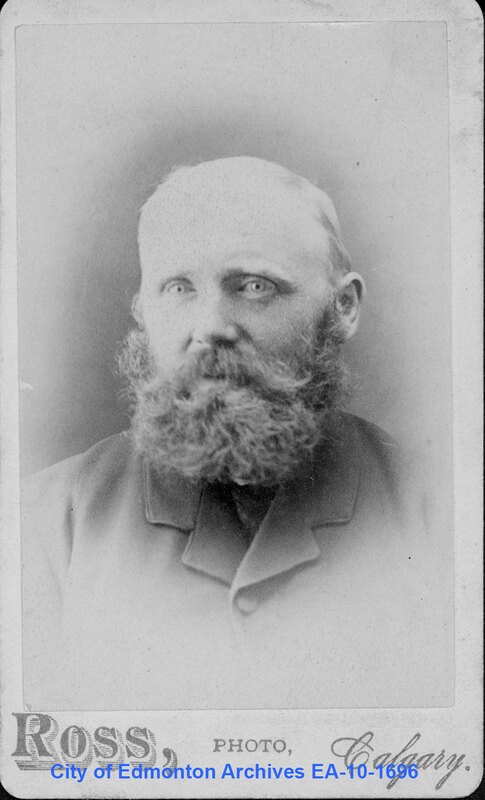 Born August 12, 1849, John Walter was the eldest child of William Walter and Helen Leask of Stenness, Orkney, Scotland. Like many remote and rugged island communities, the Orcadian lifestyle centered on self-sufficiency. John’s father worked as a farmer, boat builder and miller to support a family that grew to include two daughters, Mary and Ellen. John went to school until he was fourteen, then he apprenticed as a carpenter. The Orkney Islands had close ties to Canada. For many years, The Hudson’s Bay Company looked to Orkney as the preferred location to recruit employees. 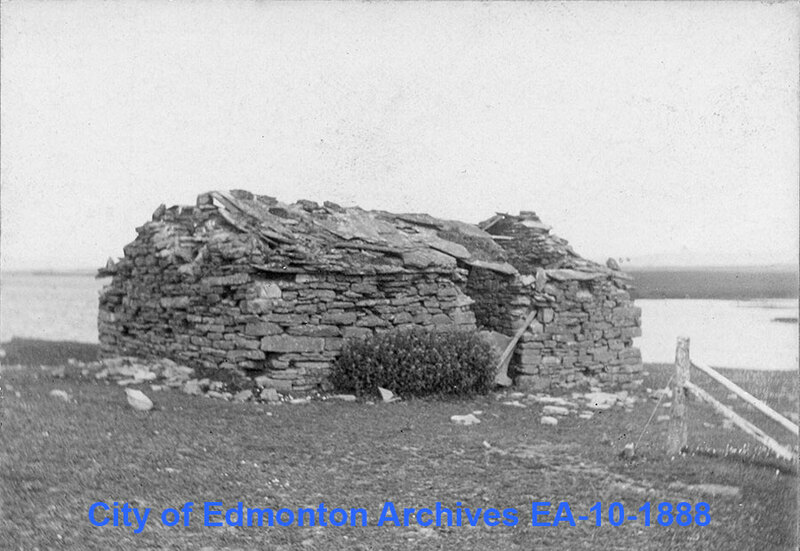 The company considered Orkney men to be hard working, hardy, and well suited to company life in the Canadian frontier. Like most Orcadian families, the Walter family had some connection to Canada through the Hudson’s Bay Company. Before he married, William Walter was employed by The Hudson’s Bay Company from 1838 to 1843. 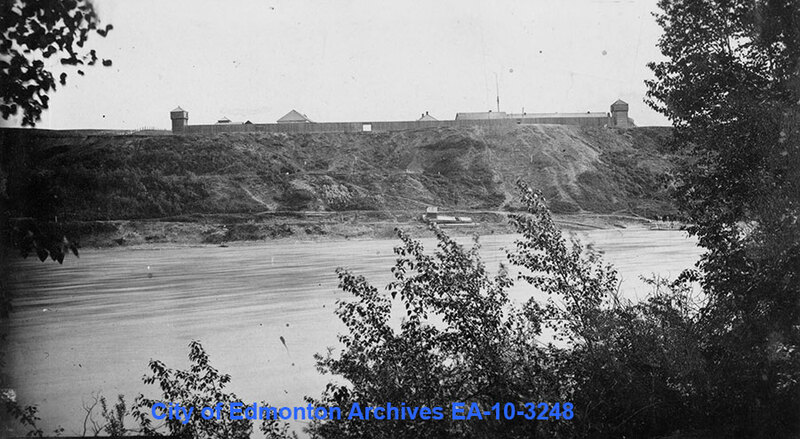 He was primarily stationed at Fort York, but it is possible he was at Fort Edmonton in 1840. It is not surprising that his 20-year old son John also signed up with the local HBC recruiter and became a company man. John signed a 5-year standard contract as a boat builder. He was paid 25 pounds for the first year and 35 pounds for the remaining 5 years. Any additional expenses other than the standard room and board were taken directly from the pay. On June 24, 1870, John and 60 other new recruits set sail from Stromness, the main port in Orkney. His journey took 5 months and involved travel in a York boat, ox cart and dog train. John arrived at Fort Edmonton just in time for Christmas dinner on December 24 along with fellow HBC officer and future settler Malcolm Groat. John began his time with the Hudson’s Bay Company at an interesting turning point for both the company and fur trade life in general. In 1869, the HBC had signed a Deed of Surrender returning Rupert’s Land to the British Crown in exchange for a large sum of cash and title to 45,000 acres of land around its 120 posts. In the coming years, fur trade life was changed with the gradual settlement of the West. Overland travel supplanted the York boat as the main way of travel and the HBC’s authority declined. John adapted and adjusted well to the changes and like a true entrepreneur saw in the changes many opportunities to prosper. The 5 years that John worked for the Company were busy ones. 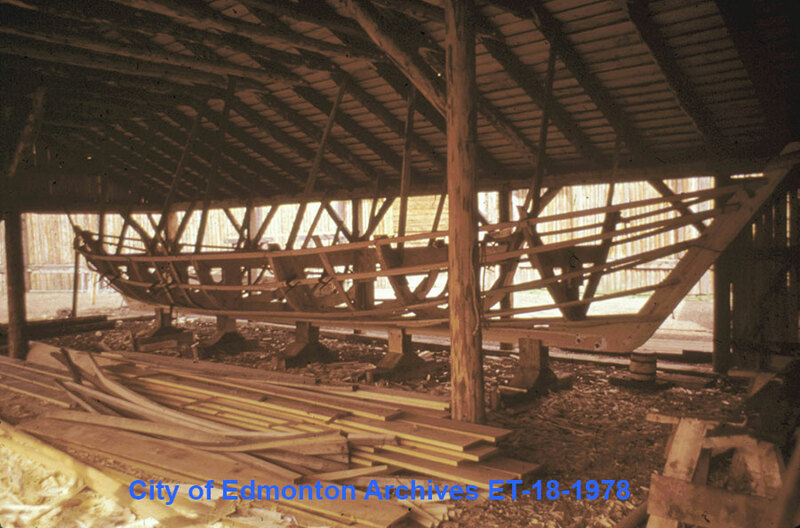 Not only was John employed as a boat builder, but his carpentry skills also contributed to many early Edmonton buildings, including the McDougall Methodist church. John made acquaintances with men who became life-long friends and associates. At the end of his HBC contract in 1875, John did not sign up for another term or return home to Orkney. Instead, he decided to try his hand at making a life outside of the Fort walls. With York boats still in demand, the company offered to pay John in cash for all the boats that he could turn out. John’s boat building business had begun. The only other thing he needed to do was to stake a claim of land and build a dwelling. 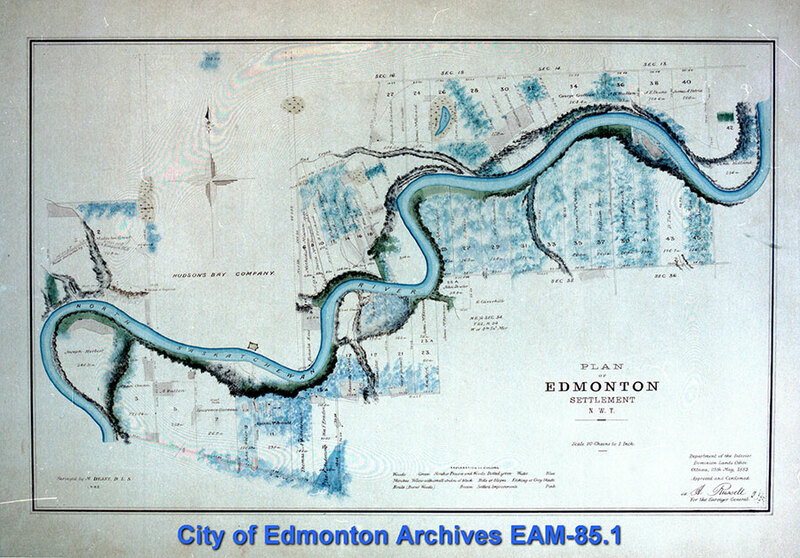 John settled on the south side of the North Saskatchewan River, directly across from Fort Edmonton on a location near the ford for crossing the river for the Calgary-Edmonton trail. This was a prime location for his boat building business and his future ferry operation. Although it has been written that John was the first to settle on the south side of the river, this is a misconception. Walter was 1 of 3 men who settled directly south of the Fort. John and his neighbours Laurent Garneau and Mr. McDonald all took up residence on their proper lots in the summer of 1876. However, the land south of the river was occupied and used by many First Nations bands for centuries. In 1877, the Papaschase band negotiated for reserve land on the south side of the river under Treaty 6. John built a 2-story dwelling close to the river bank made from logs chinked with mud. Following the 1882 land survey, John’s dwelling and cultivated fields became River Lot 9 – it granted him 155 acres, with a 2-block frontage on the river and a depth running south to what is now University Avenue. In these years, John demonstrated that self-sufficiency was the key to survival and success in emerging Edmonton. John focused his efforts on his boat building business, cultivating his land and also running his ferry operation across the North Saskatchewan River. Recognizing and answering the needs of the small community, John started a freighting business and also ran a small general store in his home. 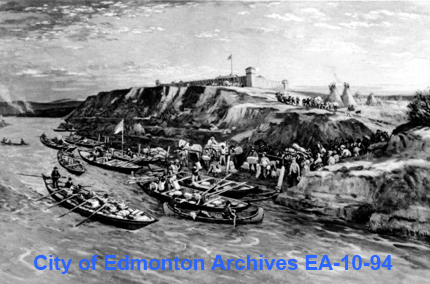 A very small settlement was slowly growing, primarily on the north side of the river, just on the periphery of the HBC’s 3,000 acres of reserve land that surrounded Fort Edmonton. It was a community of a few homes and businesses, with a population predominantly consisting of former HBC employees and Metis people. On the south side of the river, John’s home became a centre for many community events and gatherings. He was known to put up boarders if no other place could be found. 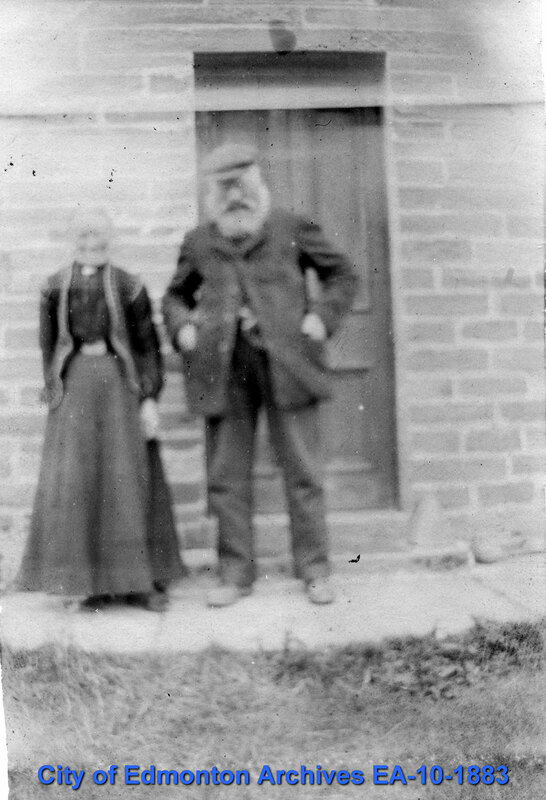 John shared his home with his sister when she arrived from Orkney in 1881. By 1884, prospects were looking good for John and he decided to build a second home on his land. Perhaps this was a way to separate his personal space from his growing businesses that occupied his first home. 1886 was a pivotal year for 37-year old John Walter. A chance encounter in April led to him meeting 21-year old Annie Elizabeth Newby, their 6 month courtship, and a wedding in October. 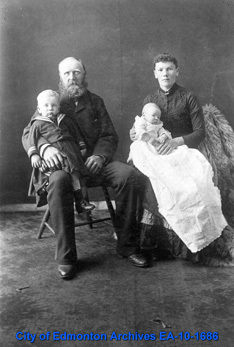 John and Annie settled into his second home and soon welcomed 2 sons, John William (1887) and Stanley (1890). John’s enterprise grew along with his family. He developed his property by moving buildings no longer in use at the Fort and refurbishing them. His property was also shaped by his opening a blacksmith and carriage shop in 1886, his continued boat building business, ferry operation, a small coal mine in 1887, and a sawmill in 1893. (See Industries page for detail). Although the sawmill became John’s biggest success, he was most recognized for his ferry. His businesses responded to the growing needs of the settlement as it developed at a rapid pace. 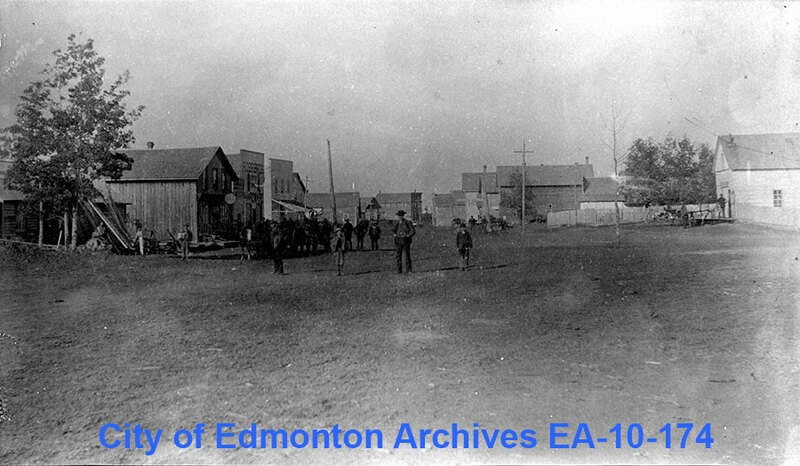 By 1891, with the arrival of the railway to southside community of Strathcona, steady settlement was well underway. Both Edmonton and Strathcona became popular destinations for newcomers from across Canada, the United States and Europe. The settlements grew to become full-fledged towns with proper services and amenities. John was involved in community affairs. 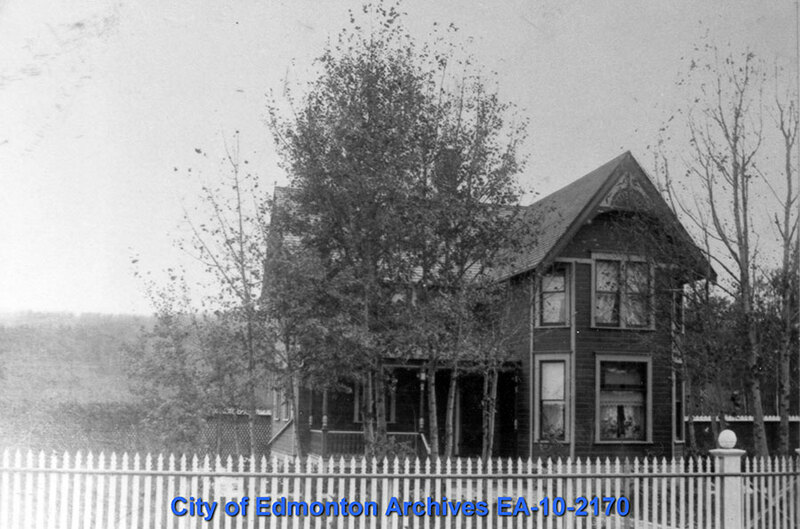 In 1891, John and a handful of men organized the South Edmonton School District, raised $800, and a built a 1 room school house which started classes in January 1893. 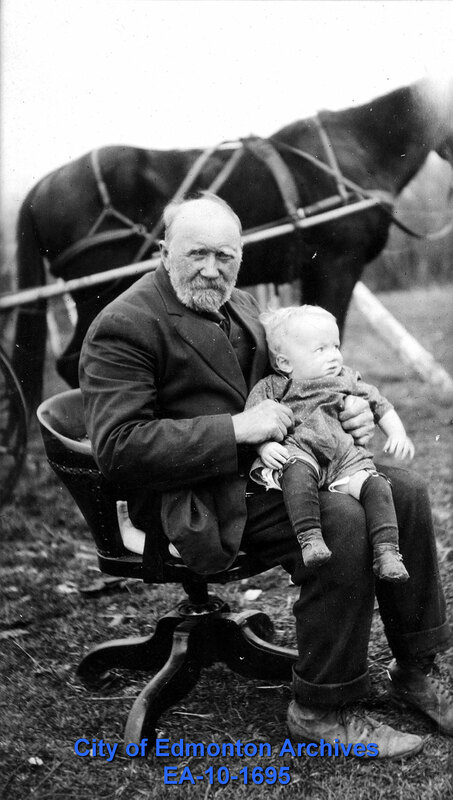 As an established businessman and even then recognized as one of Edmonton’s pioneers, John served for a year on Strathcona’s first town council in 1899 along with future first premier, Alexander Cameron Rutherford. John’s success in his work allowed for his family to live a comfortable life. To mark this lifestyle, in 1899 John started construction on a third house on his property. John’s new house was completed in 1901. With the later additions of water, electricity, sewage and telephone, the home was very comfortable. John’s prosperity in his businesses continued in relation to the steady growth of Edmonton and Strathcona. John’s lumber business grew to a second location and he opened a second coal mine that was financed by A.C. Rutherford and W.E. Ross. With his brother-in-law Frederick Sache, he also pursued real estate investment and owned many buildings and land in Strathcona. On June 7, 1907, tragedy struck as an accident occurred in his coal mine. Five men perished and it remains the worst industrial accident in Strathcona’s history. John, reputed as a fair and dedicated employer, took the accident to heart and was said to grieve keenly over the deaths of his employees. 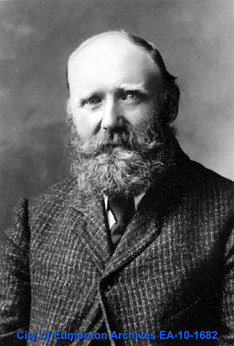 John’s last foray into the political affairs of the community was by joining the Amalgamation Committee from 1910 – 1912. The Committee was in favour of the two cities, Edmonton and Strathcona, joining together to become one. John’s businesses, particularly his lumber mill, began to suffer with the decline of the housing boom in 1912. 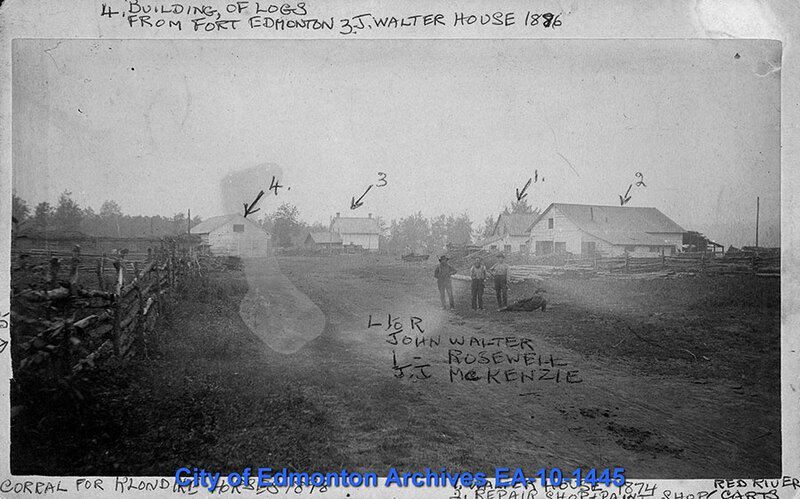 The great flood of 1915 caused great damage to his lumber business, washing away lumber stocks and sawmill and caused great damage to the Walterdale community. To add to the losses, one of John’s trusted employees embezzled a substantial amount of money. Never able to fully recover from these losses, John continued on until December 25, 1920, when he passed away, at the age of 71, in hospital after an operation for appendicitis. For 50 years, John had made Edmonton his home. He became one of Edmonton’s important figures and enjoyed the respect of all sections of the community. The Strathcona Evening Chronicle wrote: "There is no more progressive and public spirited citizen than John Walter. All in all he has probably done more for the city than another of its residents."